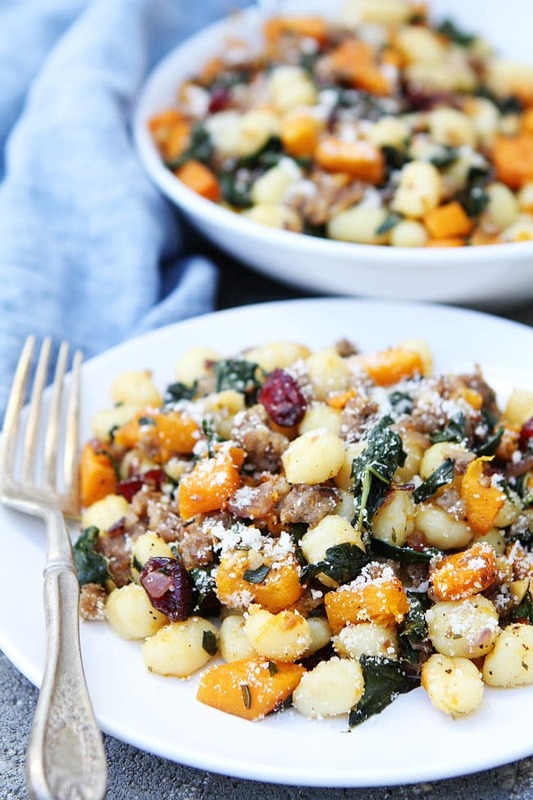 Butternut Squash, Sausage, and Kale Gnocchi-gnocchi with roasted butternut squash, sausage, kale, dried cranberries, rosemary, and Parmigiano Reggiano cheese. The perfect fall meal! Are you looking for an easy fall meal that will impress your family, friends, and even yourself? 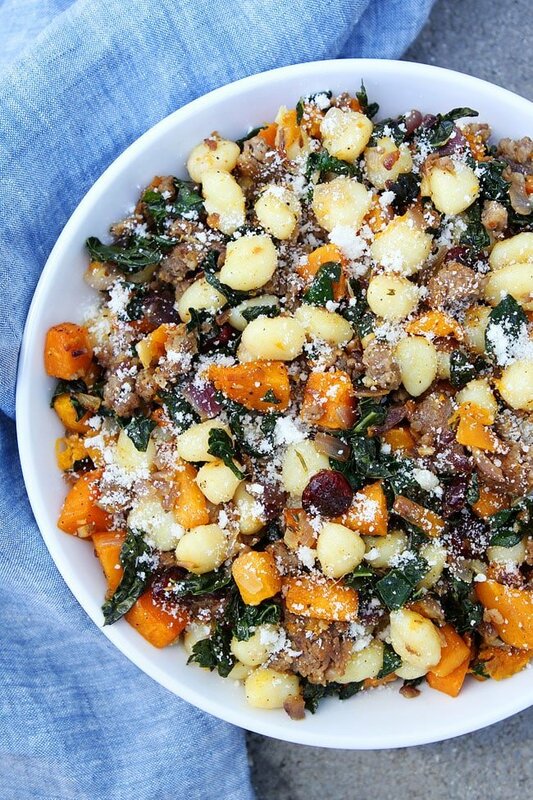 Then, you have to try this Butternut Squash, Sausage, and Kale Gnocchi recipe. It is super easy to make and has all of the BEST fall flavors in one dish! If I want our boys to eat a good dinner without any complaining or whining, I know I can always count on DeLallo’s gnocchi. They LOVE it and I love it because it is so easy! For this recipe, I used DeLallo’s mini gnocchi. The mini gnocchi is the perfect size for our little guys and it is so cute! Sausage is another winner with our boys, so I used sausage in this gnocchi dish. I also added in roasted butternut squash, red onion, kale, garlic, rosemary, dried cranberries, and Parmigiano Reggiano cheese. There are lots of fabulous fall flavors going on and the colors are beautiful too! Fall comfort food at it’s finest…and easiest! 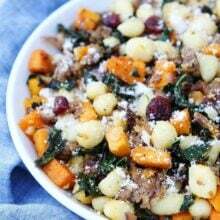 Our boys love this Butternut Squash, Sausage, and Kale Gnocchi and I think you will love it too! 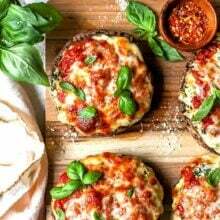 It is a great quick and easy fall meal. Make it today! 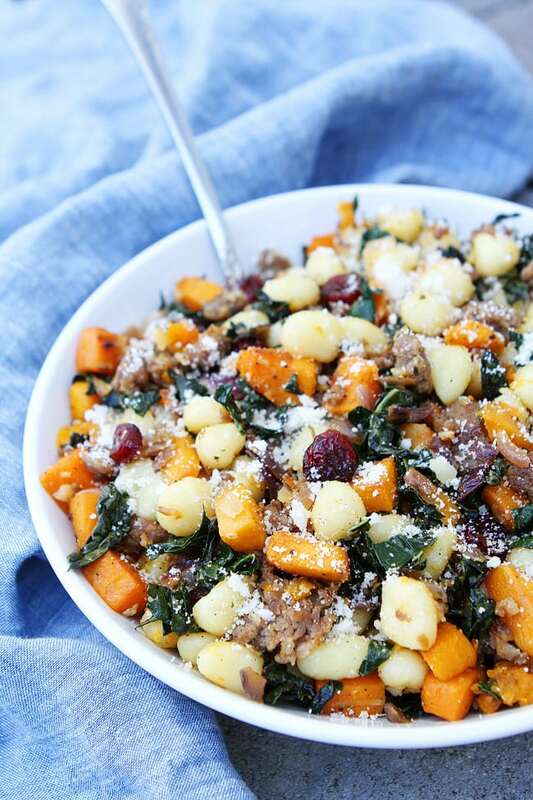 This easy gnocchi dish is perfect for fall! Preheat oven to 400 degrees F. Place butternut squash on a large baking sheet and drizzle with 1 tablespoon of the olive oil. Season with salt and pepper, to taste. Place in the oven and roast until butternut squash is tender, about 25 minutes. Remove from oven and set aside. 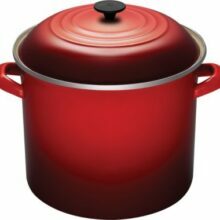 Meanwhile, bring a large pot of water to a boil and cook the gnocchi according to the package directions. Drain the gnocchi and set aside. Heat the remaining 1 tablespoon of olive oil in a large skillet over medium heat. Add the onion and cook until softened, about 3 minutes. Add the sausage and cook, crumbling it with a spoon, until browned, 5 to 7 minutes. Stir in the kale, garlic, rosemary, and dried cranberries. Cook until the kale is wilted, about 4-5 minutes. Add the butternut squash and drained gnocchi. Finish with grated Parmigiano Reggiano cheese, season with salt and pepper, and serve immediately. Note-if you need the dish to be gluten free, use DeLallo's gluten-free gnocchi. This post is sponsored by DeLallo, but our opinions are our own. Thank you for supporting the brands that continue to make Two Peas and Their Pod possible. That looks delicious! Gnocchi is one of my favourite ingredients (I actually shared a gnocchi recipe today, too!) and the addition of the squash sounds sooo right. Creamy vs creamy, yumm! Vivian: what is your gnocchi recipe? I made it long ago and used ricotta cheese instead of potato. Delish and not so heavy. What a gorgeous gnocchi! Love this! What a prefect dinner for Fall! Loving all the delicious flavors in this dish! This looks like a big bowl of fall comfort. Yum! What a tasty fall meal! Wanted to let you know that the white chicken chili was a BIG hit. Thanks again. I absolutely love these flavors together! This looks so yummy! What a perfect fall dinner! 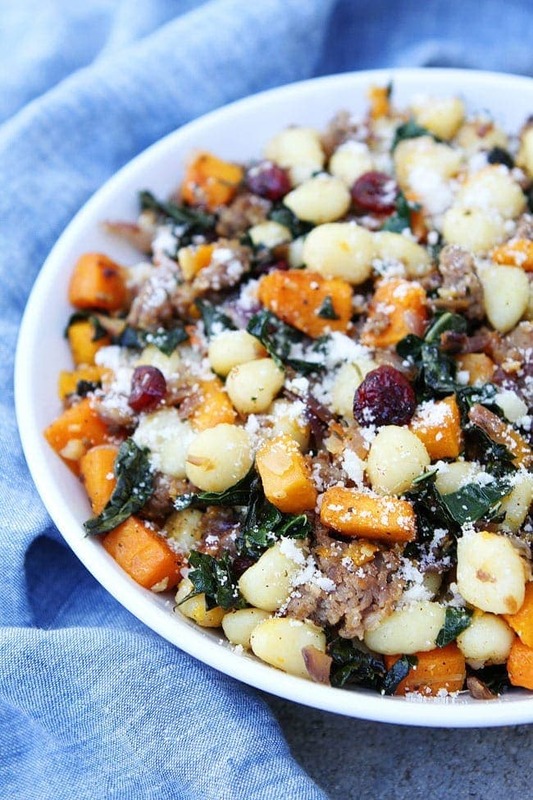 I love all these fall flavors together in one dish… So many pretty colors! I’m also intrigued by the idea of mini gnocchi. I’m not sure how much DeLallo’s products are in my area (I’ve literally only seen their espresso powder! ), but will have to hunt some down! Is the gnocchi located in refrigerated section or just on the shelf? On the shelf. Look in the pasta aisle. The absolute PERFECT fall dinner recipe!! I’m loving the mini gnocchi! I haven’t seen it in my grocery store yet, but I’ll be watching for it for sure!! I didn’t know mini gnocchi existed! I love all the vegetables you put into this, and I bet you could even use it to stuff acorn squash. Yum! Perfect fall dinner! This was so yummy! We had it tonight and everyone went back for seconds! With 3 boys I am always looking for different recipes so we don’t always have the same thing on repeat. Makes for a lot less complaining:) Thanks for sharing! I am so glad you liked the recipe. Our boys love it too! This is totally up my alley! Looks amazing! This was delicious! A great blend of tastes and colors. Very popular with my family! Excellent! I used my cuisinart to chop the kale and substituted chicken sausage . It was wonderful dish and I plan on making it again. Just made this and it was delicious! Looks pretty with the variety of veggies. Fairly simple to follow the directions & love it when the end product looks as good as the pictures. Great fall/winter recipe & it will be made again. Made this tonight and it was really good. Only thing I may pass along is go easy on the salt and pepper on the squash. The sausage contains alot of flavor, so not much, if any is needed. It was great and I can’t wait until tomorrow’s leftovers! Looks great!! Ill be making this over the weekend! What do you think about dried cherries instead of cranberries? I have the cherries in my cupboard already and would rather not buy yet another thing. Sure, I think they would be great too! You can always add one with a bite and if you like it add them all in. I used cherries cuz that’s what I had on hand and it turned out great! Also doubled the butternut squash and put a few extra handfuls of kale and it still had great flavor ratios. Awesome recipe! 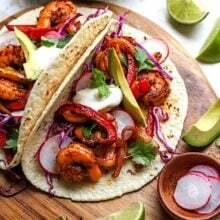 Fantastic recipe – such great flavors and surprisingly easy to make. We loved it. this was delicious… came out wonderfully… I used thyme instead of rosemary because I thought I had some and when I reached for it – it was no good. But the substitution was just great… will be making this again. My daughter loved it!!! This is a delicious recipe . If you use hot Italian Turkey sausage, it is even better! Made it minus sausage and added salmon. I also added a bit of white wine but skipped the garlic and cranberries. Yum!